Saturday a week ago, Masala Football Club secured their first victory – quite fittingly at the season mid-point and against fellow multicultural football side the Dragons (formerly known as the Southern Dragons). For those unfamiliar with Masala, they appear in World Footy News stories: Masala Football Club is born and Masala debuts in the heat. As club co-founder and current president (and a no-longer-so-active WFN correspondent) I take you behind the scenes of the club, and share our journey so far. Hopefully it’s an entertaining read – perhaps it might also prove useful to others in Australia or abroad working to get a club up and running. Through connections made with two players from the India Tigers team at the 2008 International Cup, Darren Ross and Sudip Chakraborty, I found myself co-organising an India Tigers team for the 2011 event. A good portion of the team were Melbourne-based, most without previous football experience. Following the tournament, myself and two of the Melbourne-based players – Trevor Banerjee and Fevin Mascarenhas toyed with the idea of getting the local players together to play regular footy. From there, the idea of a club with a subcontinental flavour was born. Shortly after another India player, William Fernandes was on board and we had our inaugural committee. The four of us met on a regular basis throughout 2012. Our first priority was a name, moniker and colours. We looked at everything from Tendulkar Tigers to Brown Brothers FC – but found the names to be either too exclusive (often India-centric), infringing on existing brands or simply impossible to work with. Finally we settled on Masala Football Club (meaning a blend of spices) which was perfectly reflective of the diverse team we were looking to build. However by being Masala, the choice was made not to have a moniker, and this made creating a logo more difficult. With the help of a Sydney-based student, we eventually did come up with a logo: a star anise (spice) in which the seeds have been replaced by footballs. 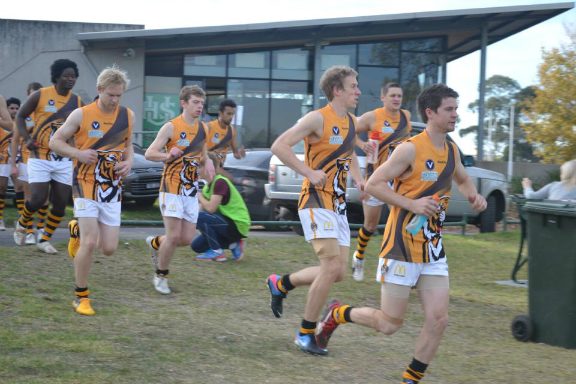 The Richmond Football Club (big supporters of the India Tigers at the International Cup) resolved our lack of colours – in exchange for us adopting the yellow and black, they agreed to provide our playing kit. 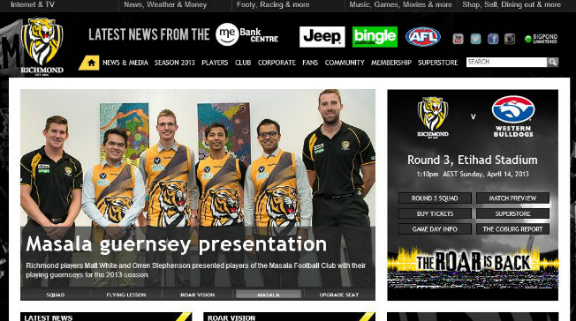 Richmond’s support has been fantastic and has included several articles about Masala on their website and a pre-season function at their Punt Rd facilities. We are hopeful of one more event with Richmond before the year is out. Our desired league, the Victorian Amateur Football Association (VAFA), agreed to consider our application if we incorporated (making us a legal entity) and submitted a Business Plan. Leagues generally require clubs to field at least two teams (seniors and reserves). Given the difficulty in getting one team together we would be applying for a stand-alone team in VAFA’s Club XVIII competition, which accommodates thirds and fourths teams for clubs in all higher divisions. This is not usually allowed, and similar concepts in the past had been required to operate under the auspices of an exisiting club (Hawthorn Spartans and their Thirds, Box Hill North and the now Dragons FC). We set to work on the constitution (or rules) – for those unfamiliar with Victorian Legislation and Incorporation Associations; you are given two options: adopt the Model Rules or create your own rules (which still need to be compliant with the legislation). Given that we had a very specific purpose for the club, we opted to create our own rules. We consulted both the Model Rules and several other publically available sporting club constitutions and then had them looked over by a legal eye (thanks to Troy Thompson for his connections). It was submitted and after a few minor alterations, accepted. It was August 2012 and Masala Football Club Inc. was officially born! Before we could start on the Business Plan we needed to set our area of operation. According to the last census, Melbourne is home to 100,000+ India-born persons (and a sizeable Sri Lankan community) and this is without taking into consideration any Australian-born children. We made a list of a few key municipalities (either due to their location or demographics) and then did a mail out to all these councils. The City of Greater Dandenong, in Melbourne’s southeast was the first to respond, and most importantly they were eager to accommodate us. Greater Dandenong is home to a large number of migrants from the subcontinent. It is also home to a large number of Melbourne’s refugees and asylum seekers, many from Afghanistan and Pakistan. Whilst the council couldn’t give us a definite answer until their official ground allocations in January, they were prepared to confirm to VAFA that they were working with us to secure a home ground. Following this the Business Plan came together quite easily and it proved a good point for us to “take stock” – we were officially registered, in talks with a league and now had an area to work with - things seemed to be progressing to plan. I arranged a meeting with Tim Noonan, General Manager of Football Operations at VAFA and formally discussed our intent. Tim listen to what I had to say, and seemed impressed by both the constitution and Business Plan, but at the same time remained noncommittal – as our application had to be voted on by the board. I was told the application would be either: accepted as submitted; accepted if we partnered with an existing club; or rejected. It was a nervous wait but at the end of October I was informed by Tim that our application was accepted as submitted and we would be playing Club XVIII in 2013. AFL Victoria approval followed shortly after… and the fun began! For all the hard work that had gone into the club up until that point, things stepped up a notch after being accepted by VAFA. We had to recruit, find a coach, a club umpire and sponsors and plan a pre-season – and none of the committee had previously been involved in a football club. We received word from the council that we would be in a ground-sharing arrangement with the Lyndale Football Club (Southern Football League), making Barry J Powell Reserve our home ground. The ground has multiple social areas meaning that we still have our own club space and the reserve has two ovals (and no longer any junior teams) meaning there is room for growth. Our recruitment started with the Melbourne-based India Tigers and their ability to sell the concept to friends, family and Facebook connections. At our first pre-season session in late January we had a grand total of six participants. Given a large number of our players are from overseas, after all had returned back to Melbourne from holidays by about mid-February our numbers were close to a full squad. We were contacted by Team Africa for a practice match which was played in early March and was the club’s first ever hit out. We managed to field a team, but had only a couple of interchange in a match that was played in near 40 degree heat. We went down by about 60 points. It was the first of three practice matches – the others played against the Dragons, Endeavour Hills and Dandenong Redlegs thirds. All were losses on the scoreboard, but wins for the team, with players gaining valuable match time. Interestingly our real player growth began after the season had commenced. Against our first official opponents, Richmond Central, we had a full playing list of around 30. Just eight weeks later that is 50. The majority of these new players are not experienced, but they bring with them skills from other sports and an eagerness to be a part of the club. Word of mouth remains our most successful recruitment method, but we have had a few players hear of us by other means. Our playing group is diverse and 70% of our squad have made their football-debut at Masala. We have players born in countries like India, Sri Lanka, Afghanistan, Estonia, New Zealand, UAE, Kuwait and Zimbabwe. Other players have both parents born in countries such as Italy and Vietnam. Our list includes an asylum seeker and a refugee. Of the 50 players on our list, 45 have had match time. We are preparing to host our own 9s tournament to make sure that all players remain engaged at the club, and have our eyes focussed on two teams in 2014. 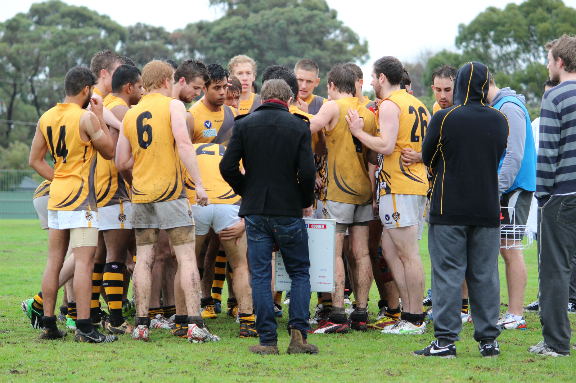 Finding a coach to lead such a diverse and inexperienced group took time – more so because we couldn’t offer any monetary return – just the opportunity to build a club from the ground up, and a few tie-ins to the Richmond Football Club. We were put in contact with Matt Peddlesden, a former Old Camberwell junior, who agreed to come on board as a playing coach. It has been one of the best decisions in the club’s short history and hopefully Matt remains on board for years to come. 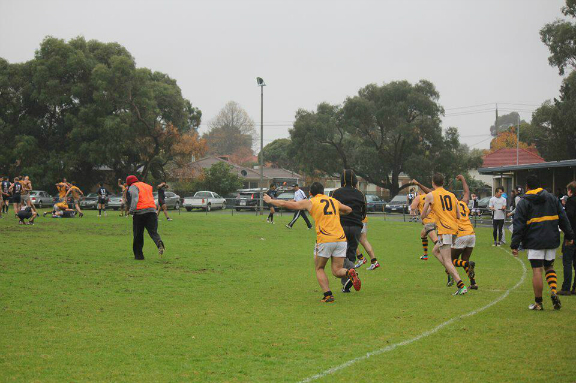 All Club XVIII teams need to provide an umpire for their home matches and this was perhaps the most challenging position we have had to fill – to the point that for our first two home matches we were borrowing an umpire from VAFA (which was testing our relationship with their Head of Umpiring). We contacted nearby junior leagues and all our connections involved with suburban football, without success. In many cases they too were seeking an umpire. Finally with the help of Gumtree we found our man! Sponsorship has secured us less money than we would have hoped, and like many football clubs we have been forced to be creative with our fundraising. Our player registration fee covers some of the cost, although we deliberately kept this low to encourage new players to try out football. We also have a Social Membership available for $50 (sign up here) which includes special offers from our partners, a club scarf and a vote out our AGM, amongst other benefits. McDonalds Noble Park (our shorts sponsor), Bank of Queensland Dandenong and Romak Hardware Distributors have all assisted financially or in kind, as has the Richmond Football Club. 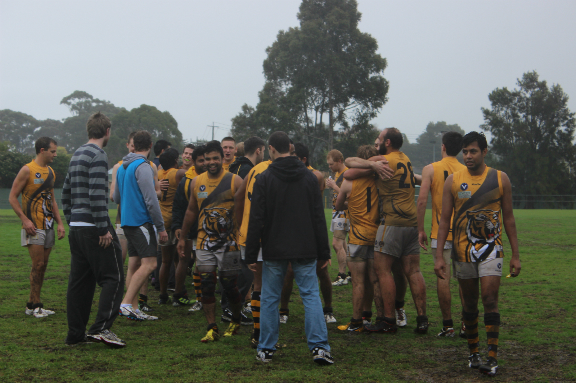 The season started with a baptism of fire – a 131 point loss away to Richmond Central. It was a reality-check of sorts for the team, who went in very optimistic, having been competitive in their most-recent practice match. In hindsight it was a difficult opener - eight rounds in and Richmond Central remain undefeated and yet to be truly challenged this season. Since the first match, the team has continued to improve and now resemble a football team. 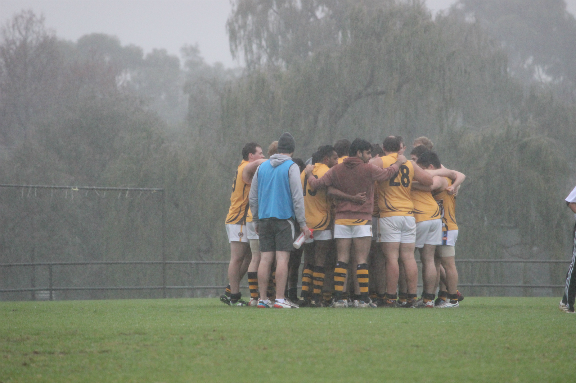 On June 1, in incredibly wet conditions, the players’ hard work paid off and Masala defeated “rivals” the Dragons. It was a four quarter effort – Masala leading at all the breaks, in a very physical encounter. Making the victory all the more sweeter, when the sides met in Round 2, the Dragons were 82 point victors (although Masala was awarded the points after it was found the Dragons played unregistered players). 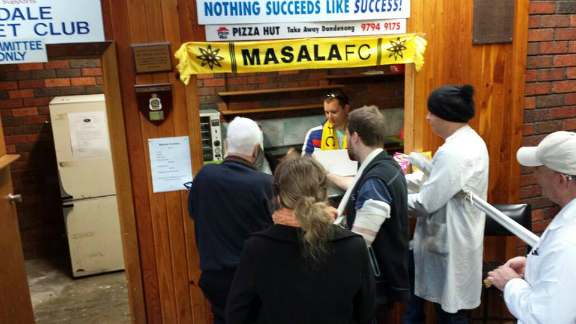 For those interesting in seeing Masala in action, this Saturday at 2pm we take on Eley Park Sharks at home. We will be holding a kids football clinic beforehand. To show your support of Masala, like our Facebook page or follow us on Twitter. If you’re keen to be involved – either head down to training on a Monday or Wednesday evening at 7pm or sign up to a Social Membership. Great work, Ash. Go Masala! Great work to you, Ash, and the entire crew at Masala in getting the club to this stage of development so quickly. All the best, Masala, for the future, and an invitation always exists to become a brother club with my team up here in Cairns. We would be proud to stand beside you. 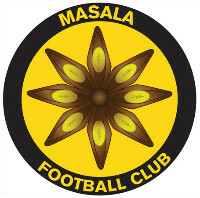 To have Masala competitive in season one and a realistic prospect of having 2 teams by season two is tremendous. I love the idea of having an internal 9s competition to make sure everyone is getting some game time too - it's easy to lose players that are on the fringes that aren't getting to play, and it should develop their footy much faster too. It's always a tough balance with amateur footy clubs - have too many players and you'll lose players at the fringe who have just as much right to be playing their sport as anyone else, but have the bare minimum and suddenly injuries and holidays will catch you short.